Acoustic fields produced by a phased array transducer are calculated using boundary diffraction wave model, which is a computationally effective line integral model and can provide an exact solution of the total radiation field from the transducer. The near-field radiation fields from a 64-element array transducer are simulated with the variations in the steering angle and the focal point to investigate the characteristics of beam patterns systematically. This systematic investigation is very crucial not only for the optimization of the transducer design parameters but also for the determination of the focal law in the near-filed. Recently, ultrasonic phased array systems are paid great attention due to their unique capability of providing images of the inside of a specimen in a real time fashion. Since the image formation result from the steering and focusing of the radiation beam from the transducer, optimization of the array transducer is essential for the enhancement of image quality. For the optimization of array transducers, it is necessary to examine the ultrasonic beam radiation field from the transducer. Even though fundamental concepts of the array transducer have been introduced long time ago , the radiation field from the array transducer has been analyzed only in the far field with some approximations [2,3] and there have not been performed sufficient studies on the near field. In many realistic ultrasonic nondestructive testing, however, the near field zone is one of the most important regions to be inspected, so that the radiation field in the near field should be investigated thoroughly. In this paper, to investigate the focusing and steering behavior in the near field region, the boundary diffraction wave model (BDWM) [4,5] is employed for the calculation of the entire radiation field from a phased array transducer with 64 rectangular elements. The radiation fields from the transducer are simulated with the variations in focal point and steering angle, and the changes in the true focal point and its lateral size are examined. Finally, the effect of frequency change is shown and the time domain signal is predicted under the assumption that the array elements have the frequency responses with Hanning windows. The pressure field radiating from a planar piston source can be obtained by use of the Rayleigh-Sommerfeld integral model that is in a form of 2-D surface integration . By applying the Stokes' theorem, this computationally inefficient model can be converted to a 1-D line integral model which is known as the BDWM given in Eq. (1) . where, as shown in Fig. 1, x is the point in the medium, y0 is the point obtained by projecting the point x to the plane of the transducer surface, re is the radius from y0 to the transducer edge, f is the angle between x-axis and re, re is the distance from the point x to the point of transducer edge, n is the unit normal vector to the transducer, and q is the angle between re and unit normal vector n, r is the material density, k is the wave number, c is the wave speed of the material, v0 is the spatially uniform velocity of the transducer surface, and er is the unit vector. Fig 1: Geometrical terms when pressure is evaluated at a point x. In fact, the BDWM is a quite general model so that it can be used to calculate beam fields from various transducers including planar transducers with arbitrary cross-sections. Recently, Song and Kim  have shown the effectiveness of this model to the calculation of the radiation fields from rectangular piston sources. As a natural extension of their work, the radiation field from a phased array transducer can be obtained by the superposition of the radiation fields from individual array elements with the proper phase delays. Geometry of an array transducer used in this simulation study is shown in Fig. 2. Center frequency of the transducer is assumed as 7.5 MHz and hence the wavelength, l , in steel is about 0.79 mm. To avoid grating lobe, the pitch, p, is determined as 0.3 mm that is less than half of the wavelength. The inter element gap is 0.1 mm that is sufficient to suppress the cross-talk between neighboring elements. The lateral dimension, D, of the transducer is 19.1 mm, while the element length in the elevation direction is 6 mm. Thus, the near field length, D2/(4l ), of the transducer becomes about 115 mm. Focusing and steering of the radiation beam were done in the lateral plane that passes through the center of the array transducer. Electronic delay times are optimized for the focusing and steering at the 10 points (F1, F2, ..., F10) shown in Fig 3. All of the points are located in the near field of the transducer and evenly spaced with the spacing of 10 mm. In the case of F10, for example, ultrasonic beam is electronically steered to 45 degrees and focused at the 50 mm in axial depth. Fig 2: Geometry of an array transducer Fig 3: Focal points in a steel specimen. Fig. 4 shows an example of radiation fields from the transducer when the beam is focused at (a) infinity without steering, (b) F2, (c) F5, and (d) F10 by electronic time delay. The beam is well focused within near field length without grating lobe. 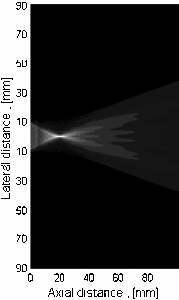 As the focal point come closer to the transducer, the beam beyond the focal point spread out quickly. Fig. 5 (a) and (b) show the on-axis pressure field when the beam is focused at F3 and F5, respectively. The actual focal points, which have the maximum on-axis amplitudes, appear ahead of the desired focal points, and the deviation gets bigger as the focal point is deeper. In fact, when the electronic focal point is infinity, the array transducer focuses naturally at the near field length. Fig. 6 shows the comparison of the actual focal depths to the desired focal depths together with the lateral sizes of the ture focal points. Fig. 7 shows the off-axis pressure field when the beam is focused at F10. The lateral dimension of the focal point at -6 dB is 7 mm. Fig 4: Radiation fields from the array transducer when the beam is focused at (a) infinity without steering, (b) F2, (c) F5, and (d) F10 by electronic delay time. Fig 5: On-axis pressure fields for on-axis when the beam is focused at (a) F3 and (b) F5. Fig 6: Comparison of the actual focal depth to the desired focal depth together with lateral size of the actual focal points. Fig 7: Off-axis pressure fields when the beam focused at F10. Fig. 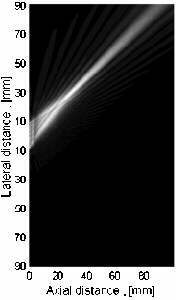 8 (a) shows the variation of lateral size of focal point with frequency when the beam is focused at F3. For the same focusing condition, amplitude variation of the focal point with frequency is shown in Fig. 8 (b). These results tell that the higher the frequency is, the better the focusing capability is. Fig. 8 (c) shows the predicted time signal at F2 by simulation. The simulated time signal is obtained by inverse Fourier transform of the frequency response at F2. In this case, it is assumed that each element has center frequency of 7.5 MHz and the Hanning windowed frequency bandwidth from 1 to 14 MHz. From the calculated time-domain waveform, it is possible the measure the axial size of the focal point. Further simulation to obtain time signal for the various center frequency and frequency bandwidth will be useful to design array transducer for the optimal axial resolution. Fig 8: The variation of (a) lateral size of focal point and (b) amplitude with frequency when the beam is focused at F3. (c) The predicted transient waveform at F2 by simulation. Radiation fields of ultrasonic beam from an array transducer having 64 elements is examined while the beams are electronically focused and steered within near field length. 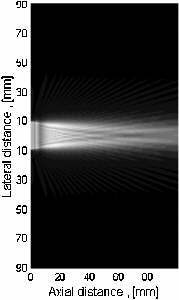 The boundary diffraction wave model efficiently used to obtain the radiation field in near as well as far field of the array transducer. Lateral size of the focal point for the various locations of focal points and for various frequencies is considered. Waveforms in the time-domain were also predicted by using inverse Fourier transforms. Analyzing the size of focal points at various depths and angles will be useful for the optimal design of the array transducer. The authors are grateful for the support provided by a grant from the Korea Science & Engineering Foundation (KOSEF) and Safety and Structural Integrity Research Center at the Sungkyunkwan University. A. Macovski, "Ultrasonic Imaging Using Arrays," Proceedings of the IEEE, vol. 67, No. 4, pp. 484-495, 1979. L. Azar and S. C. Whoo, "Experimental Characterization of Ultrasonic Phased Arrays for the Nondestructive Evaluation of Concrete Structures," Materials Evaluations, Vol. 75, No. 2, pp. 134-140, 1999. G. S. Kino, Acoustic Waves: Devices, Imaging, and Analog Signal Processing, Englewood Cliffs, NJ: Prentice-Hall, 1987. L. W. Schmerr, Jr, Fundamentals of Ultrasonic Nondestructive Evaluation, A Modeling Approach, Plenum Press, New York, pp. 167-181, 1998. L. W. Schmerr, Jr, A. Sedov, T. P. Lerch, "A boundary diffraction wave model for a spherically focused ultrasonic transducer," The Journal of the Acoustical Society of America. Vol.101, No. 3, pp. 1269-1277, 1997.